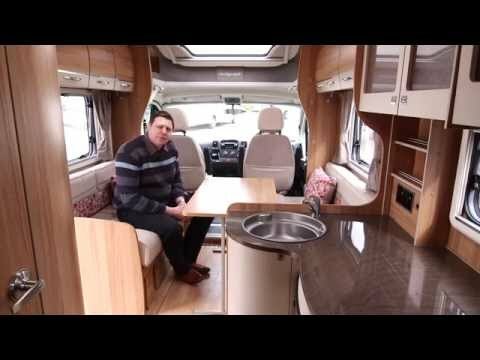 Since it introduced its first motorhome in 2011, development at motorhome and caravan-maker Bailey’s Bristol manufacturing base has been frenetic. Two years ago came the Approach Autograph range, along with the more car-park-friendly Compact, and this year the firm launched the entry-level Approach Advance range. With that in mind, it’s no surprise that changes to the top-spec Autograph for 2015 have been minimal. There’s a switch to the new Peugeot cab, and the arrival of a new layout, the four-berth Bailey Approach Autograph 730. At the time of its launch and our test, the Approach Autograph 730 starts at £46,965 on the road, and our test vehicle cost £47,373. There is no doubt the new black cab gives the Autograph a more handsome face, but there’s also no getting away from the fact that this is still a fairly boxy-looking ’van, its shape dictated by Bailey’s Alu-Tech build method of sandwich-construction walls and roof clamped together at the seams by an aluminium frame. Boxy it may be, but it’s kept low by the lack of an overcab and the use of Al-Ko’s ultra-low-profile AMC chassis. It’s a shame the toilet cassette has to be emptied from the awning side – not ideal if you have a table and chairs set up outside. Despite being a large four-berth, the 730 has just two belted travel seats – this is resolutely a layout for couples who want to tour in luxury, so the forward double is only likely to be used by unexpected guests. Like all Autographs, the 730 uses the smaller 130bhp 2.2-litre HDi turbodiesel. That’s not a lot of power for a ’van of this size, but if you stir the six-speed manual gearbox it rows along perfectly happily. The 2015 cab is a big improvement in terms of fit and finish, and features a DAB radio with Bluetooth connectivity. It’s also good to see such a huge motorhome sneaking under the 3500kg limit for B licence holders, but with its 25ft length we’d have liked to see a rear-view camera (it is pre-wired should you choose to fit one). At least there’s a rear window to make reversing easier. In the lounge, you might be forgiven for thinking that you’re in one of Bailey’s top-spec caravans. And this is not accidental – with its front parallel lounge, central kitchen and washroom, and rear transverse bed, the 730 will tempt those looking to chug instead of tug. It works well, too. The lounge feels huge thanks to the Autograph’s 2.4m (7ft 11in) width, and to our eyes the optional (£199) ‘Piccadilly’ upholstery works better in a larger ’van. We’re less keen on the flimsy table, though, which is stored under the rear bed. You’d be hard pushed to find fault with the roomy kitchen. Worktop and storage space are superb. The microwave is concealed in a cupboard, though we’d rather it wasn’t directly over the four-burner dual-fuel hob, which tops the separate oven and grill. The pièce de résistance is the transverse island bed – fitted with the optional (£209) bespoke bedding set on our test ’van. With large side and rear windows it makes a luxurious master suite, as long as you’re not tall: the bed is compact at 1.77 x 1.32m (5ft 10in x 4ft 4in). Your guests will have no such restriction: the sofas make up a second double that’s a huge 2.23 x 1.21m (7ft 4in x 4ft). It’s just a shame there’s no screen to separate the two sleeping areas. and a radiator in here. Throughout the ’van there’s enough storage space in the overhead lockers, plus a full-height wardrobe and bed boxes to seriously test its 433kg payload. The largest area is to be found beneath the fixed bed, accessed by lifting the mattress or using the huge external locker door. Bailey has even added a couple of underfloor lockers for valuables – very handy. Whether it’s day or night-time, the excellent Alde wet central heating system will keep the ’van warm and toasty. Like its Autograph siblings, the Bailey Approach Autograph 730 offers an exhaustive specification list for a hyper-competitive price tag. It’s also vastly spacious, with a huge ‘spare’ bed, so the lack of additional belted travel seats is frustrating.